I had a plan to finish my latest project today but it hasnt happened so instead I thought I would write about my music. I've started this several times now, I'm realising music is too much part of my life to be able to write one post about it. I guess what I want to get at is that there are times when music is part of my life and I go to rehersals and I do the odd concert and I enjoy it. There are other times when walking into a music department almost feels like a second home, and not only because you spend so much time there! More because there are friends who put their head round the door when your practicing just to say hi, and because you are somehow valued for the part you play. Because when rehersals are cancelled you can end up going for a drink with 2 girls, one of which you've never spoken to before. And because any day you go in you can meet someone new and you might not be friends for life but you can have a chat and learn something and its another familiar face next time your there. 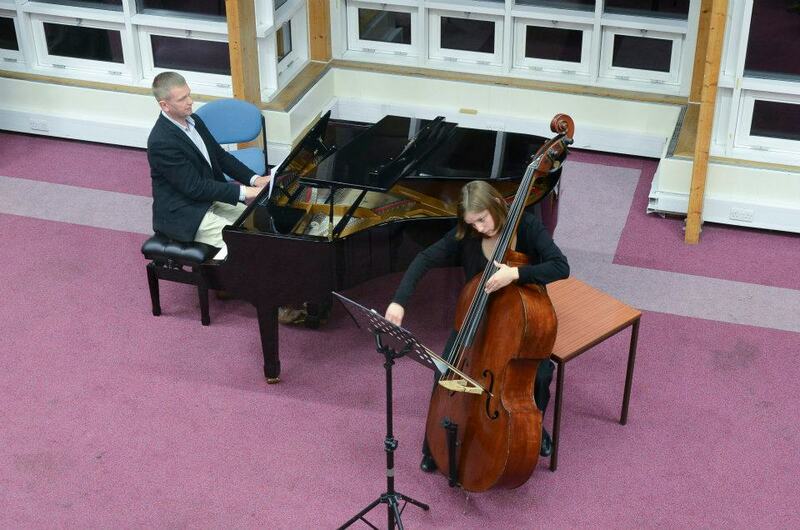 Last year, my first year of uni, I was banned from playing bass and piano for medical reasons and I really missed playing. I didnt realise at the time what I actually missed was having this group of friends. This year it's taken a while to get to know everyone but I'm really enjoying it, I'd forgotten what a big part of me music can be and it's nice to be reminded. 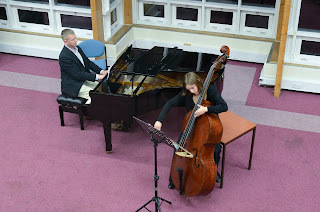 This is me concentraing hard, playing my first ever bass solo in the uni scholars concert before christmas.... just to add some colour to all the writing!